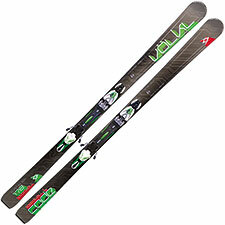 New for the 2013-2014 season, Volkl's Code Speedwall L offers performance skiers a fun and lively alternative to both the RTM and RaceTiger lines. I'm not big on the RTM skis (see my most-hated video), and the RaceTigers are race specialists, so for me the Code L vaults to the top of Volkl's frontside carver list—especially if you like a retro feel. Yes, the Code L is tip and tail rockered. But like Rossignol's excellent Pursuit HP, the Code L gives us evolved rocker that doesn't impose turn shapes on the rider. What is perhaps most surprising about the Code L is how amenable it is. Volkl's RTM-84 absolutely elevates the level of the average skier, but it does so by taking charge. That kind of ski can quickly seem overbearing to riders who have their own ideas when it comes to turn shapes and styles. The Code L maintains (and possibly even exceeds) the RTM's ease of use, but vastly improves upon what you might call the ski's willingness to cooperate. In this way the ski feels distinctly Old School. Especially if you like to work your ski from tip to tail, the Code L is like coming home. In fact, my first thought riding it was that I'd stepped back into the past—but in a good way. Here is exactly the ski you'd get if you took a world cup GS plank circa last 1980's, updated its sidecut and width, and gave it the very best of today's nuanced early rise tip and tail technology. Admittedly the Code L is not in the same class as bleeding-edge screamers like the Fire Arrow EDT or the Bolt—but who cares? It's a heck of a lot of fun to ride. Arguably would-be Code L riders ought to embrace modernity and get a pair of Bonafides instead, but I have to say I find the Code L very tempting. If you remain committed to owning skinny skis, you can get a lot of mileage out of a ski like this. In fact, the Code L may perfectly fit your (hopelessly archaic) definition of "All-Mountain". In my notes I called it, "A surprisingly off-type high level performer." If you prefer to ride narrow frontside skis, the Code L is delightfully versatile and never demanding. It does give some ground in absolute edge grip and elite-level carving performance, but it's the kind of ski you'll be happy riding all across the mountain, day in and day out.